Egypt and Cyprus are blessed with proximity to the Eratosthenes Seamount, now 700 metres below sea level. Eight million years ago it was an island surrounded by coral reefs. “These provided the biomatter that rotted and created the gas,” says Nikolaou. A spate of gas discoveries is changing the strategic value of the eastern Mediterranean, and it began in earnest in 2009, offshore Israel, which has found about 35 trillion cubic feet of gas – enough to power the country for a century at current rates of consumption. This has not only satisfied a decades-long quest for energy security amid hostile neighbours – Israel already produces 60 percent of its electricity from its own gas. Israel is using its hydrocarbons to power regional diplomacy. It has already signed agreements to sell gas to Jordan and Lebanon, which previously relied on Egypt and Syria. Thanks to the speed with which it is attracting investment, Israel eclipsed them as an exporter. The United States Geological Survey estimates that the marine basin between Egypt, Cyprus, Israel, Lebanon and Syria can ultimately yield 350 trillion cubic feet of gas and 3.5bn barrels of oil. That is enough to power the region for decades, or the European Union for 20 years, and it is this prospect of exporting energy to a wealthy and strategically important region that is binding four countries in a common vision. In the autumn of 2014, European Commissioner Maros Sefcovic, responsible for the European Union’s energy security, met with the energy ministers of Israel, Cyprus, Greece and Italy in Rome. The subject of the meeting was an aspirational project: a 1,900km pipeline that would convey gas from Israel and Cyprus, via Greece and Italy, to the European market. The pipeline, dubbed East Med, was originally the brainchild of Greek energy minister Yannis Maniatis. Greece’s Public Gas Company (DEPA) and Italy’s Edison had formed an alliance the previous summer to build it, but they needed EU support. “The Israeli minister was due to speak before us,” says Maniatis, recalling the occasion. “And he suddenly launched a verbal assault on the Commissioner and the other Europeans present saying, ‘I don’t understand why you are not more actively promoting East Med, which will convey natural gas from my country and Cyprus. Don’t you want cheaper natural gas for your citizens?’ [Cypriot energy minister Yiorgos] Lakkotrypis and I looked at each other, thinking that Israel had just emerged as our strongest ally. We had prepared a little speech of our own but we said nothing. We did not need to. 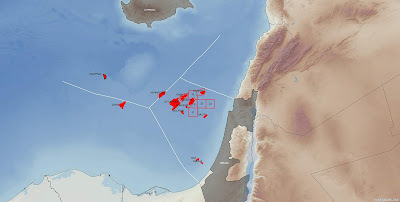 Israel had just discovered Leviathan, so we were effectively being supported by the biggest gas supplier in the area.” Leviathan is the biggest of Israel’s deposits, containing two thirds of its known reserves. Israel is a relative newcomer to hydrocarbons, but it is a pivotal player because its discoveries prompted new explorations offshore Egypt and Cyprus. After a string of Israeli discoveries in 2009-11, Egypt put up 15 offshore exploration zones for tender. And it was an Israeli company, Noble Energy, that discovered Cyprus’ first offshore gas field, Aphrodite, in 2011. Through East Med, Israel, Cyprus, Greece and Italy now seek to forge a physical and diplomatic umbilical cord with the EU. The proposal could not have been more timely, because Europe’s main source, North Sea gas, is beginning to dwindle, and Europe had just discovered the dangers of reliance on Russia. In January 2009, the political tussle between east and west came to a head over Ukraine. Its pro-Russian president, Viktor Yanukovich, had rejected a customs union with the EU – a milestone on the way to membership – in favour of a trade deal with Russia. The popular reaction toppled him and the acrimony spread to the two countries’ state gas monopolies. Naftogaz Ukrainy played a game of brinkmanship with Gazprom, refusing until the last minute to pay for $1.6bn of gas deliveries. On January 7, Gazprom shut off supplies to Ukraine for a fortnight. The EU relies on Russia for a third of its gas, and Ukraine is one of two transit countries. A complete cutoff had never happened since the pipeline system had been built in Soviet times, and it caught Europe unprepared. Domestic production and deep reserves kept western Europe warm; but southeast Europe, lacking infrastructure and entirely reliant on Russian gas, suffered industrial shutdowns and frozen homes. The Ukraine crisis was a turning point in EU-Russia relations. The European Commission sought to punish Gazprom for abuse of its dominant position, which it felt had exacerbated the 2009 shortages. In 2015, a three-year investigation found that Gazprom contravened the EU’s free movement of goods by prohibiting member states from re-selling surplus gas to each other. Gazprom was forced to renegotiate its contracts. Gazprom was also accused of making exports to Bulgaria and Poland conditional on their allowing new pipelines to be built across their territories. This effectively killed the South Stream pipeline, which would have carried Russian gas across the Black Sea to Bulgaria. The cancellation of Russian pipelines refocused EU efforts on creating a so-called Southern Corridor for gas from the Shah Deniz fields of Azerbaijan, through Turkey and Greece. A consortium of European oil majors, Trans-Adriatic Pipeline, or TAP, has now nearly completed a pipeline that will carry gas across northern Greece to Italy, while a Turkish-Azeri consortium is completing the Trans-Anatolian pipeline across Turkey. The gas is on schedule to start flowing in 2020. Russia has also relaunched the cancelled pipeline across the Black Sea under the name Turkish Stream, and is building it to Istanbul instead. A sister pipeline, Turkish Stream 2, is in the offing. DEPA and Edison may now revive the idea of a second pipeline from Turkey to complete the journey of Turkish Stream gas to western Europe. Events seem to be vindicating the Russians. “The vision was always that there will be enough gas discovered proximate to a corridor of three pipelines coming through Turkey, and that would constitute a supply counterweight to Russian gas, and would happen by 2020,” says Jonathan Stern, Senior Research Fellow at the Oxford Institute for Energy Studies. Since that EU vision arose, however, Russia and Turkey have become close allies in Syria. Russia is supplying two thirds of Turkey’s gas and is building Turkey’s first nuclear reactor. Not everyone is convinced that East Med is viable in purely commercial terms. 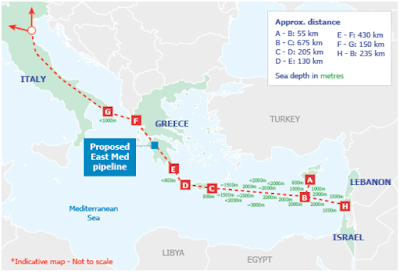 “Unless considerable additional quantities of gas are found in the eastern Mediterranean… I don’t think that this pipeline is commercially feasible,” says Sir Michael Leigh, who runs a programme on the implications of eastern Mediterranean gas discoveries at the German Marshall Fund. Cohen estimates the pipeline’s cost at $10bn, which would put Mediterranean gas at a higher retail price than Gazprom’s. “For the project to be viable, the EU would have to provide billions of dollars of subsidies,” she says. The head of Greece’s exploration licensing body, Hellenic Hydrocarbon Resources Management, believes that an EU subsidy will be an easy sell given the pipeline’s political importance. “We’ll raise the price of gas a few cents and we won’t even feel it. That’s how it’ll work. That’s how it always works,” says Yannis Bassias. The EU seems to be seriously considering the project. In 2013 it listed East Med as a Project of Common Interest, one possibly worthy of EU funding. Two years later, it put two million euros into a pre-flow study, and this year approved 34.5mn euros to help draft a detailed marine survey of the route the pipeline would follow on the sea floor, and an engineering design study. DEPA, which has drafted the only existing feasibility study, insists that “East Med is technically viable, commercially competitive and economically feasible,” although it won’t say at what gas price these things hold true. Kostas Karayannakos, its Executive Director of Gas supply, considers it “slightly more attractive” than piping the gas through Turkey, or liquefying and shipping it. The key attraction of East Med seems to be stability. It would be a risk-free, intra-EU route carrying committed volumes of gas to Europe for a quarter century. Europe would in turn be a reliable client, in contrast to cash-poor, regional economies. “We used to seek out investors in East Med. Now they are seeking us out,” Karayannakos says. For Karayannakos, the pipeline brings tremendous geopolitical advantages, rendering Greece, “the EU’s ‘bridge’ to the important resources of the Levantine, while it is already Europe’s ‘gateway’ for Caspian gas,” making Greece, “an integral part of Europe’s energy security chain,” and “ending the isolation of Cyprus.” The combined flows of TAP and East Med would make Greece the conveyor of six percent of the gas the EU consumes. It is precisely this vision, of a pipeline that circumvents its exclusive economic zone, turns Cypriot energy interests into European energy interests, elevates the importance of Greece in the EU and offers Greece and Cyprus a leading role in the EU’s relations with the Middle East, that concerns Turkey. Its displeasure has already caused one high-seas standoff. On February 23, shortly after discovering Calypso, the Saipem 12000 drillship homed in on a body of water east of Cyprus known as Block 3, where ENI also has exploration rights. Its intention was to bore a hole into a deposit known as the cuttlefish prospect. It never reached its intended co-ordinates. Five Turkish navy frigates blocked its path. The drillship trod its water until February 28, when it attempted to circumnavigate the blockade. One of the frigates threatened to ram it. The drillship turned and sailed for Morocco. During precisely the same period, a Turkish coast guard vessel rammed a Greek one in the Aegean – an unprecedented event many analysts attribute to the discovery of Calypso. Two decades of talks have so far failed to reunify Cyprus, divided by a Turkish invasion in 1974. A Greek attempt to overthrow the government in Nicosia that year led Turkey to believe that the island’s union with Greece was imminent, and that under such an arrangement Turkish-Cypriots would have no guarantee of political equality. Since then, Turkey has maintained an occupying force of almost 40,000 troops on the island, and supplanted much of the original Turkish-Cypriot population with settlers from the mainland who are more sympathetic to Ankara’s vision of maintaining strategic depth in the Mediterranean. The Turkish Republic of Northern Cyprus, proclaimed in 1983, remains an internationally unrecognized entity, and the ongoing occupation isolates Turkey diplomatically. The Cypriot government says it will share its mineral wealth with the Turkish-Cypriots in the north after a reunification deal is struck. Concerned that this increases Cypriot leverage, Turkey insists on the wealth being shared now. To press the point home, Turkey has announced that it will send its government-owned drillship, the Barbaros Hayreddin Pasha, to explore Cyprus’ exclusive economic zone. Turkey is something of an exception in the region. Egypt, Israel and Cyprus defined their exclusive economic zones early this century. They have ratified these bilateral agreements, sold concessions to oil majors, struck gas, and Israel and Egypt are already extracting it. Turkey is the only country in the eastern Mediterranean that has so far found no proven and probable resources even though, in Syrigos’ estimate, it has spent at least $560mn on acquiring two seismographic research vessels and a drillship. It is also the only country that hasn’t defined its exclusive economic zone with neighbours, and disputes theirs. In 2004, Turkey suggested drawing a line midway between its coast and Egypt’s, riding roughshod on the rights of the countries inbetween. Egypt politely refused. In 2011, Turkey agreed an exclusive economic zone with the Turkish Republic of Northern Cyprus. The zone claimed by the TRNC sits almost exactly on top of the zone the Republic of Cyprus has already settled with its neighbours to the east. The zone claimed by Turkey sits on top of much of the zone Cyprus has agreed with Egypt, to the south. 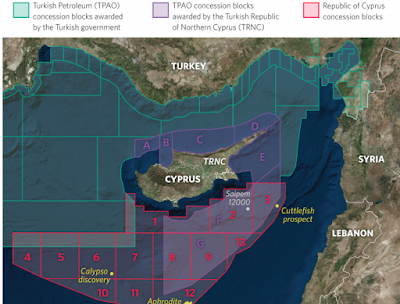 On the same day that this agreement was signed, the TRNC signed over its EEZ to the Turkish state petroleum company (TPAO), thus pitting Cyprus directly against Turkey in virtually all its hydrocarbon explorations.